A team of Engineers from Caltech have for the first time created a light detector that integrates two disparate technologies—nanophotonics, which regulates light at the nanoscale, and thermoelectrics, which translate temperature differences straightaway into electron voltage—to differentiate different wavelengths of light, including both infrared and visible wavelengths, at high resolution. Light detectors that differentiate between different colors of heat or light are used in various applications, including satellites that monitor changing landscape and vegetation on the earth and medical imagers that differentiate between healthy and cancerous cells based on their color variations. 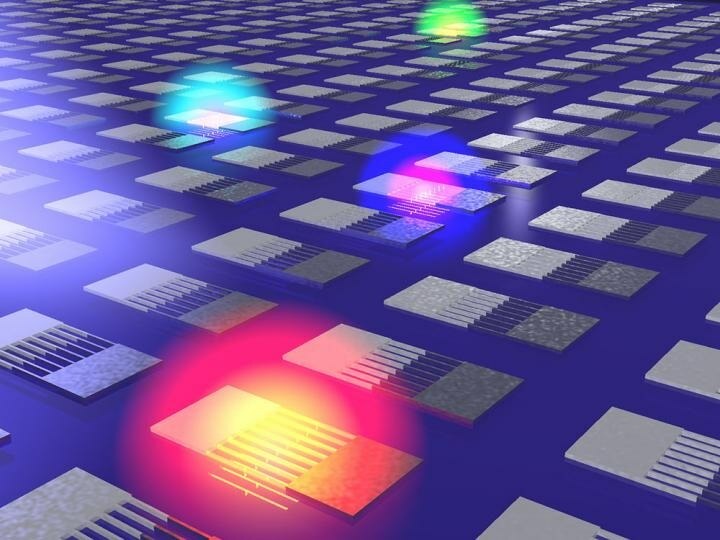 The new detector, described in a paper in the May 22nd issue of Nature Nanotechnology, operates approximately 10 to 100 times faster than existing comparable thermoelectric devices and is capable of detecting light across a broader range of the electromagnetic spectrum than traditional light detectors. In traditional light detectors, incoming photons of light are absorbed in a semiconductor and stimulate electrons that are trapped by the detector. The movement of these light-excited electrons generates an electric current—a signal—that can be measured and quantified. Although effective, this type of system makes it hard to "see" infrared light, which is composed of lower-energy photons than those in visible light. Since the new detectors are potentially capable of trapping infrared wavelengths of heat and sunlight that cannot be gathered efficiently by conventional solar materials, the technology could result in better solar cells and imaging devices. In nanophotonics, we study the way light interacts with structures that are much smaller than the optical wavelength itself, which results in extreme confinement of light. In this work, we have combined this attribute with the power conversion characteristics of thermoelectrics to enable a new type of optoelectronic device. Atwater is the Howard Hughes Professor of Applied Physics and Materials Science in the Division of Engineering and Applied Science at Caltech, and Director of the Joint Center for Artificial Photosynthesis (JCAP). JCAP is a Department of Energy (DOE) Energy Innovation Hub concentrated on formulating a cost-effective technique of turning water, sunlight and carbon dioxide into fuel. It is led by Caltech with Berkeley Lab as a key partner. Atwater's team developed materials with nanostructures that are several nanometers wide—smaller even than the wavelengths of light that denote the visible spectrum, which ranges from approximately 400 to 700 nm. The Researchers built nanostructures with varying widths, that absorb different wavelengths—colors—of light. When these nanostructures absorb light, they produce an electric current with a strength that matches the light wavelength that is absorbed. The detectors were fabricated in the Kavli Nanoscience Institute cleanroom at Caltech, where the Researchers formed subwavelength structures using a mixture of vapor deposition (which condenses atom-thin layers of material on a surface from an element-rich mist) and electron beam lithography (which then cuts nanoscale patterns in that material using a focused beam of electrons). The structures, which resonate and produce a signal when they absorb photons with specific wavelengths, were developed from alloys with recognized thermoelectric properties, but the research is relevant to a broad range of materials, the authors say. This research is a bridge between two research fields, nanophotonics and thermoelectrics, that don't often interact, and creates an avenue for collaboration. There is a plethora of unexplored and exciting application and research opportunities at the junction of these two fields. The research paper is titled "Resonant thermoelectric nanophotonics." Co-authors from Caltech include Keith Schwab, Professor of Applied Physics; Ragip Pala, Senior Research Scientist; Graduate Student Dagny Fleischman and Postdoctoral Researchers Seyoon Kim and Slobodan Mitrovic. This research was funded by a DOE Office of Science grant.